Cessna 340/414 Owners: Enhance Your Investment! 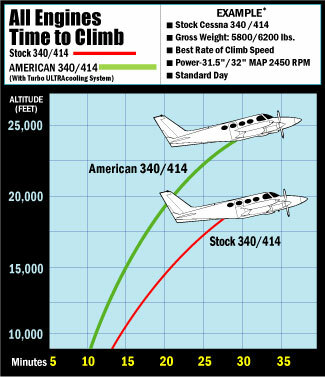 Cessna 340/414 Owners: Enhance Your Investment! You have made a substantial investment in the purchase of your Cessna 340 or 414. Upgrading it with a Turbo ULTRAcooling System will allow you to climb better, fly faster and cover more miles between overhauls and airframe inspections. 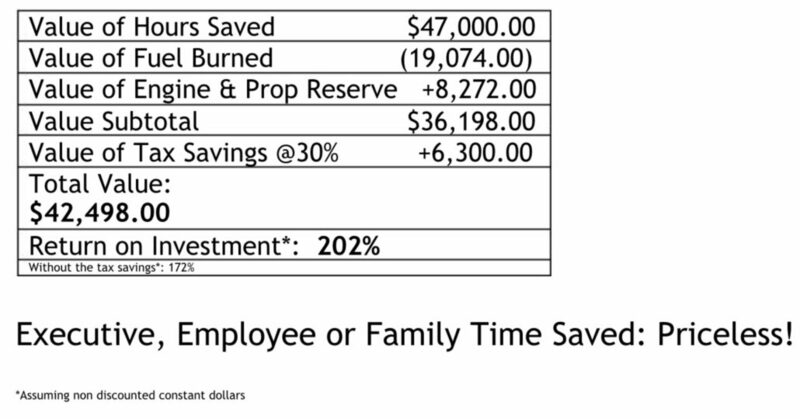 The cost of these upgrades will more than pay for themselves, and they will continue paying dividends in improved performance, increased efficiency, greater safety, and lower maintenance costs. Plus, they increase the resale value of your aircraft. In short, it’s the ultimate application of turbo-intercooling technology. 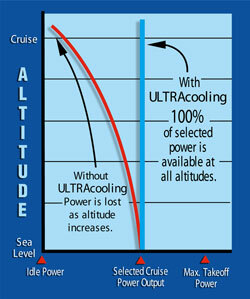 ULTRAcooling maintains near constant induction air temperatures at all power settings and flight conditions. For instance, while the standard 414 intercooling system allows induction temperatures to vary between 180 degrees F to 200 degrees F at altitude, ULTRAcooling (under the same conditions) maintains temperatures between 70 degrees F and 90 degrees F. At medium altitudes ULTRAcooling reduces the induction air temperatures, approximately 110 degrees F. To understand what that means to your engine, try remembering the last time you flew an aircraft with carburetor heat. When you pulled the carb heat on, the engine’s power diminished. But flying the 340 or 414’s turbocharged engines with the basic intercooler is like flying with the carb heat on all the time. ULTRAcooling is like carb heat in reverse where hot induction air is cooled as it’s routed through the Ultracooling System (like pushing the carb heat off) immediately restoring the engine’s lost power. The cooler induction air is much easier on your engines. 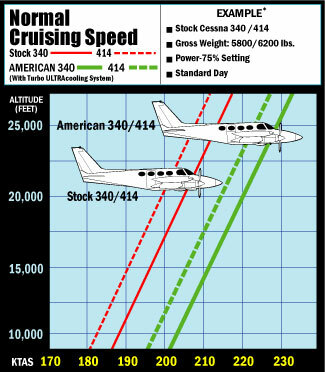 Inefficient stock cowlings and poorly designed stock intercoolers only reduced engine inlet air temperatures from 250F to 190F, causing a loss of power as altitude increases. American Aviation’s Turbo ULTRAcooling system reduces engine inlet air tempurature from 220F to 85F, Providing 100% power at all altitudes. Our ULTRAcooling System was specifically designed for the Cessna 340/414 engine with the help of the latest computer aided design technology. The System consists of three major assemblies: (1) A custom designed, high efficiency aluminum alloy heat exchanger that cools the heated compressed induction air using the colder outside air. (2) High flow induction manifolding, that transfers induction air throughout the system with greater efficiency. (3) An aerodynamically engineered P-51 style cowling and inlet that maximizes the recovery of ram air velocity from the propeller. This provides high pressure cooling air to the heat exchanger core at all power settings and flight condition. All three sections of the design interact perfectly with one another for optimum thermodynamic efficiency. When you combine the 100 % pressure recovery from the inlet with high flow manifolding and proper heat exchanger design, the results are near constant inlet air temperatures at all altitudes and power settings.The benefits of this work extend throughout the entire spectrum of the aircraft’s performance. 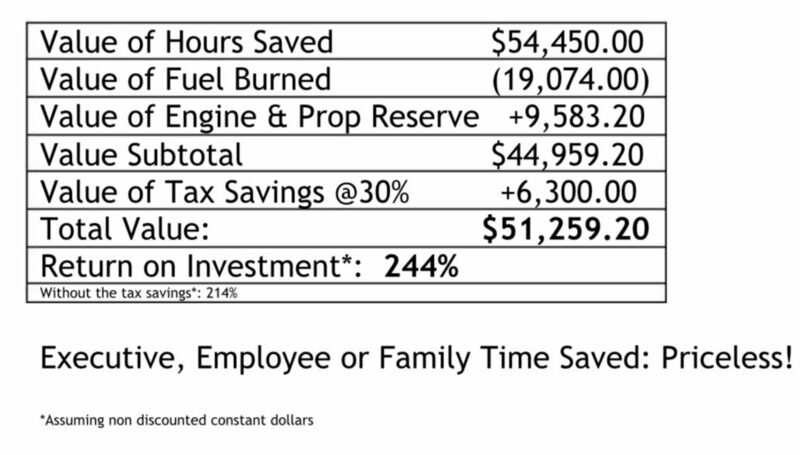 ULTRAcooling dramatically improves hotter than standard day operation, high than sea level takeoffs, single engine operation, engine temperatures, and fuel efficiency. Plus, you’ll have the advantages of better engine detonation protection, improved twin engine climb rates, and higher cruising speeds. Since your aircraft’s intercooler was designed more than 30 years ago and by today’s standards it is relatively ineffective, we specifically developed an ULTRAcooling System for the 340 and 414. American Aviation is one of the pioneers in the development of modern state-of-the-art intercooling technology. With years of aeronautical engineering experience devoted exclusively to the dynamics of intercooling, we have emerged as a dominant factor in this highly specialized field. One measure of our capability is the expanding number of Supplemental Type Certificates (STC’s) awarded by the FAA from American Aviation ULTRAcooling Systems. More than 1000 satisfied operators currently fly their aircraft with American Aviation Systems contributing to improved aircraft performance. Since your 340 or 414 is equipped with an intercooler, we don’t have to sell you on the benefits and advantages of turbo-intercooling. Such numbers as 200 knots maximum cruising speed and 900 feet per minute climb at recommended power settings are probably very familiar to you, with proper credit given to the turbo-intercooling system.